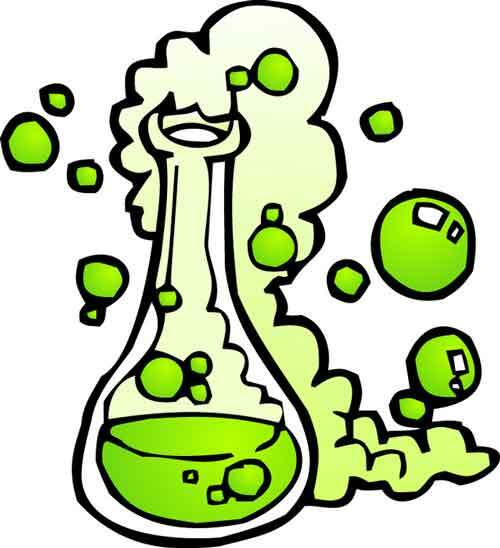 A chemical reaction is an interaction which occurs between two or more than two substances to form a new substance. For example, oxygen and hydrogen react with each other to form a new substance called water (H2O). Chemical reactions happen all the time around you, even without your notice. The food that you eat goes to your stomach and there it reacts with many chemicals including acids to digest the food. Other examples of everyday life chemical reactions include; rusting of iron, burning of wood, photosynthesis, and combustion in the cars. Substances that chemically react with each other are called reagents and reactants. Reactants are consumed in the reaction. The new substance that is formed is called the product of the reaction. Why do Chemical Reactions happen? Chemical reactions occur because molecules of different substance interact with other, in such a way that chemical bonds are broken and formed. Chemical reactions need to be expressed in the simple form so that it can be understood easily. For this reason, chemists use chemical equations. Chemical equations use the symbol for elements and molecular formula for the compounds to express the substances. The reacting substances are placed on the left side. Whereas, newly formed substance are placed on the right side of the equation. Both left and right of the equation are separated by symbol (→). The head of the arrow is used to point in the direction of the reaction; from reacting substances to products. In this type of reaction, two or more than two substance react with each other to form a new substance (product). For example, Carbon from coal and oxygen from the atmosphere will react to produce carbon dioxide. The equation of the reaction is C + O2 –> CO2. When a substance is broken down into its constituent parts, then it is called decomposition reaction. For example, water is decomposed into its constituent parts, which are hydrogen and oxygen with help of electrolysis. You can consider this reaction as opposite of synthesis reaction. The equation of the reaction is H2O –> H2 + O. In this type of reaction, an element will replace another element which is already part a substance. For example, if a substance AB is composed of element A and B, reacts with the element C. If this element C takes the place of B in the reaction will result in the formation of new substance AC, and release of element B. The equation of the reaction is AB + C –> AC + B. In this type of reaction, two substances will exchange their constituent elements, resulting in the formation of two new substances. For example, a substance AB is made of element A and B, reacts with other substance CD, which is composed of element C and D. Now in the reaction they will exchange their constituent elements; element B and D will exchange their position. The equation of the reaction is AB + CD –> Ad + CB. In a chemical reaction, new substances are created from reacting substances. Chemical reactions can produce heat and light. For example, burning of wood. Many rockets use the reaction of oxygen and hydrogen for their propulsion. Abdul Wahab, "Chemical Reactions," in Science4Fun, April 13, 2019, http://science4fun.info/chemical-reactions/.